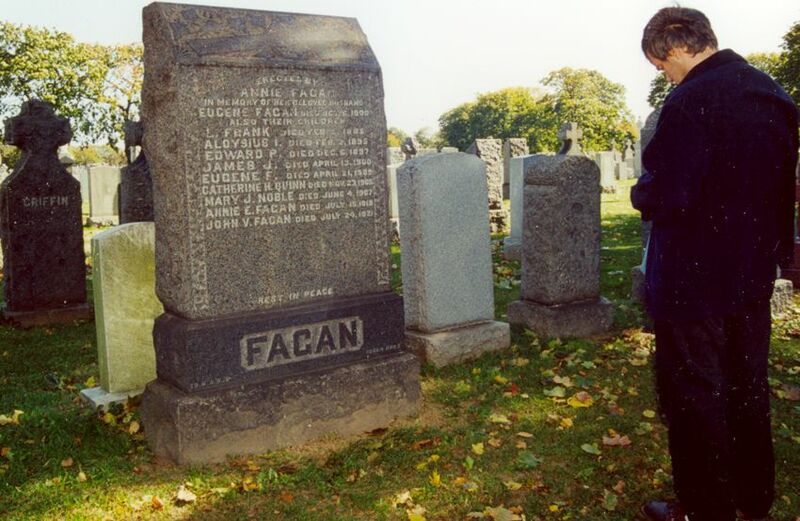 Eugene, the second son, was the most visible and established of the Fagan men in Manhattan, the owner of a family plot that served as a resting place for children of two of his brothers and his mother, Mary Caffrey Fagan. I know of Eugene's life entirely from research done since April 2000, when James Caffrey in Ireland found Eugene's 1833 baptismal record in Castlerahan's church registers. Once I knew of his existence, I was able to unearth much public material. However, the only surviving private material in our family that mentions Eugene's existence was a hand-written list of Matthew Fagan's siblings which mentions a brother named Owen. I have since confirmed that Owen was indeed a name Eugene went by. Eugene reportedly immigrated in 1861 (age 28), but I have found no record of his presence in the US prior to his naturalization in Manhattan on Oct 26, 1866. Although this was the same day that brother Edward filed for his own naturalization, they took place in different Manhattan courts. Edward's and Eugene's are the only confirmed naturalization records I have found for Fagans. Eugene's witness was Patrick Gafney, who lived at 122 East 22nd st., a couple doors from his in-laws, the McGaughrans. A point of interest: among his naturalization papers is Eugene's sworn statement that he filed his original declaration of intention in Boston on Sep 15, 1863, and subsequently lost the certificate he was given on that date. Unfortunately, I have found no evidence of activities in Boston by Eugene or by any other Fagan who fits the known family profile. Did Eugene fight in the Civil War as did brother Edward? Laurence's and Eugene's dates would accommodate this scenario. However I've found no evidence of his name or Laurence's in pension files for New York State. That Edward served under an assumed name (as many did) is a reminder that evidence of his brothers' service could be hidden. We know of Edward's service only because his descendants kept his pension papers. After 1866, Eugene was visible in all censuses and most directories until his death in 1900, with shop and home listings in the area between E. 25th and E. 30th Streets and 2nd and 3rd Avenue. Several addresses put Eugene within a few buildings of the photographer of an early 1870s family photograph which was taken at 420 3rd Ave. The McGaughrans were from Crosserlough (townland unknown), County Cavan, a parish that bordered Eugene's Castlerahan. Perhaps Eugene and Annie's families were acquainted in Ireland, but their proximity in Manhattan may have been the result of a tendency among some immigrants to settle in neighborhoods populated by natives from their own Irish counties. Annie's parents, James McGaughran and Catherine Reilly, died in 1860 and 1863, and buried in their plot with them are three of Eugene and Annie Fagan's children. Eugene and Annie Fagan's life centered around St. Stephen's Church on East 28th Street (nr 3rd Ave), and it was here that his children and his brother Matthew's children were baptized and his brother Edward was married. There was a 30-40 year span of involvement of the family with St. Stephen's. During the 1890s Eugene's oldest sons Edward and Eugene also took out listings as horse-shoers, though when they entered the picture, they began using the spelling FAGEN, as Eugene had used on his naturalization papers. That spelling was short-lived. Remaining family members retained the FAGAN spelling. Despite the suggestion of financial stability, the adult mortality rate in Eugene's family was high. Only one of his nine offspring lived beyond the age of 37. At the time of Eugene's death (from malarial fever and valvular heart disease) on Oct 6, 1900, four of the nine had died. Within a few years of his own death, Eugene's two daughters Katherine (aka Helen K. or Catherine H. Quinn) and Mary (Mary J. Noble) and Eugene Jr. died. All were in their mid 30s. When Eugene's wife Annie died in 1919, only two offspring survived her. Both died within two years, at the ages of 36 and 44. The predominant causes of death were infectious diseases (TB, cholera, "convulsions"), but there was enough early heart disease to suggest congenital or environmental factors. The one exception was the 15-year old Aloysius, who died in 1895 of epilepsy. Four of the nine children married, and though I am aware of only three grandchildren alive during the 1920s, there is a potential of surviving descendants under the names of Quinn, Noble, Norton and (a remote possibility) Fagan. 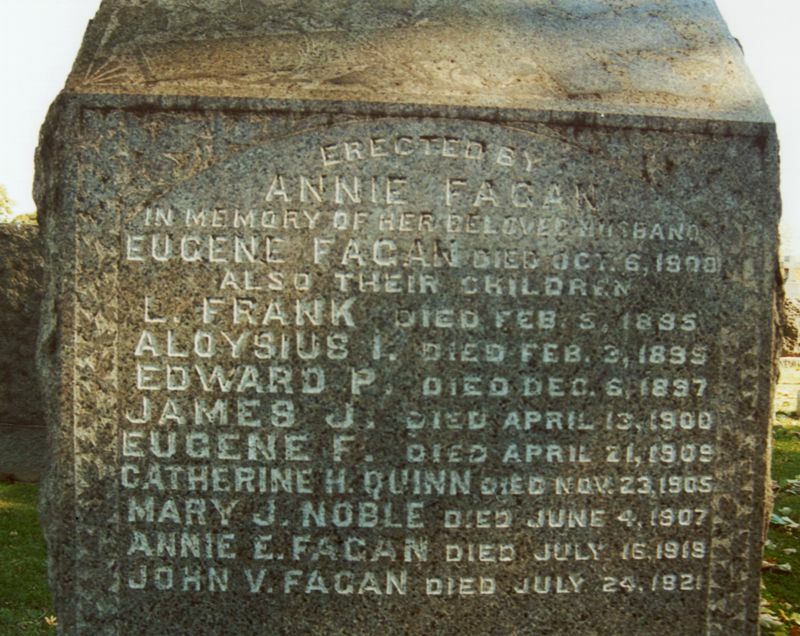 Although Eugene's earliest plot in Old Calvary was used by his brothers, his first three children to die (Lawrence Francis-1885, Edward R.-1897, Aloysius-1895) were buried in the in-law McGaughran plot in section 2 of Old Calvary. In May 1900, Eugene purchase a plot in Section 28 of New Calvary for the burial of his son James. Five months later, Eugene himself was buried in that plot. In May 1903, upon the death of her son Eugene Quinn, his daughter Catherine Fagan Quinn purchased the two plots adjoining her father's. She herself was buried here two years later. All but one of Eugene's children who died from 1900 forward were buried in these plots, along with Catherine's surviving son Frank, buried there in 1977. 15 year old Frank Quinn was living with his grandmother Annie Fagan in 1910, his father having remarried after his mother's death and begun a new family. In a minor mystery, Frank Quinn was double-counted in the 1910 census. His father Patrick Quinn listed Frank and his sister Helen, but he listed their ages so dramatically wrong that I doubt that the children lived there. Pensioned from the NYPD in 1921, and deceased in 1934, Patrick's police pension records only mention the two children by his second marriage, suggesting that his children by Catherine Fagan were removed from his life. The headstone on the section 28 plot lists all Eugene Fagan family who were buried in this and in other plots in Calvary. 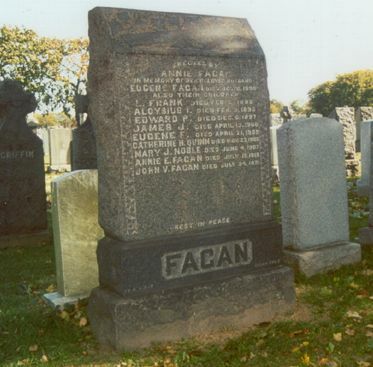 Only Louis Fagan, buried in 1920 in St Raymond's in the Bronx was omitted. Oddly, Quinn burials in this plot are also omitted from the inscription. I assume that Annie McGaughran Fagan maintained the inscription until her death in 1919 and someone else, possibly a Quinn, added the name of her son John, who died two years after her. The informant to Annie's death certificate was clearly unaware of her background, suggesting, perhaps, that the remaining family was fragmented. Eugene Fagan's brother Matthew's own Calvary plot, purchased Jan 2, 1900 at the death of his wife Margaret Egan, is the adjoining section of Calvary 3. Eugene's last surviving offspring died in Manhattan on July 24, 1921. John Vincent Fagan, age 44, left a will offering a postscript to Eugene's story. While the bulk of his estate was left to his late brother Louis' baby daughter Ann, John named as executrix his cousin Johanna, daughter of his uncle John Fagan. This clue was the key that exposed the older John Fagan to the light of day. Catherine Helen QUINN (Oct 9, 1868-Nov 23, 1905, m. Patrick H. Quinn, NYPD, 2ch. Frank and Helen, b. mid 1890s). | |-- Helen (QUINN) NORTON, b. Nov, 1896 Manh., NY, d. aft Aug 1977, NY? | | & George NORTON, b. ca. 1890 S. America, m. ca. 1930? NYC?, NY, d. aft 1934 NY? \-- Ann FAGAN, b. ca. Jun, 1917 Bronx? NY, d. aft Apr 14, 1930 NY?